Making an accurate diagnosis for a hen that looks sick, but doesn’t have respiratory symptoms, is nigh on impossible. 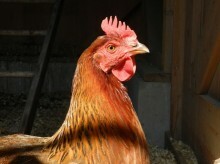 Chickens exhibit the same symptoms for a myriad of diseases. Walking like a penguin, standing hunched with wings down, a dark comb, off-feed, a hitch in the gait, droopiness, and straining when laying, can be due to a long list of diseases including but not limited to: cancer, tumors, peritonitis, internal laying, egg bound, and ascites. Sadly, most of those issues cannot be cured. Some hens will die soon after you see the symptoms, others can live for a long time looking poorly. I had a Barred Rock hen, Eleanor, that lived for three years in a slow and crotchety way, and it was only after death, when I did a necropsy, that I was able to determine that she was an internal layer with many other health issues. But sometimes, the hen does not have a lethal disease. Sometimes the hen has what I call an imbalance of inputs and outputs. What the hen eats and drinks is equal to what she ejects in the forms of manure and eggs. The egg is mostly protein and minerals. This process of making those eggs, day after day, is depleting, and as the hen ages it gets increasingly harder for her to replenish her system. It can go out of whack. Often, when this is the issue, your hen’s comb will change color and she’ll hunch up and barely move. (See Agnes’ story here.) If this is the case, then the Spa Treatment can help. It also is effective when a hen has ingested toxic plants. The Spa Treatment is also effective in fixing minor blockages. Sometimes the hen has a mild glitch in her intestinal or reproductive tract. Her muscles need to contract to move things along, and perhaps they’ve weakened. Sometimes an egg forms incorrectly, and the resulting mass is hard to expel. The Spa Treatment will move things along. What I call The Spa Treatment is simply a nice long soak in an epsom salt bath, a dose of olive oil, and TLC. Epsom salt is a combination of magnesium and sulfate. You can find it in the pharmacy, as it’s used by people as a laxative and as a foot soak. For such a simple and inexpensive product, it has many curative functions. The magnesium improves circulatory health, flushes toxins, improves muscle and nerve function, maintains the proper level of calcium in the blood and increases oxygen use. The sulfates help form brain tissues and joint proteins, creates mucin proteins that line the digestive tract, detoxifies contaminants, and improves absorption of nutrients. Obviously, it’s a general and potent cure-all. Fortunately, it is absorbed readily through the skin, which makes treatment with it easy. So, how do you know if what ails your hen can be helped by the Spa Treatment? As always, when you suspect that your hen isn’t well, it’s best to isolate her for a day. This enables you to see whether she’s eating, if she’s producing manure, and if so, what it’s like. You’ll also see if she’s laying. These are all clues to whether there is a blockage (nothing coming out) or an infection (nasty looking manure) or an egg laying issue. (Soft egg? No egg but a runny discharge? Egg bound?) In many of these cases, I’ve had success using the Spa Treatment. Sometimes, after treatment, the hen will go on to be healthy for a few more weeks, sometimes for years – it all depends on whether there is an underlying issue that can be fixed, or if there is a terminal ailment. 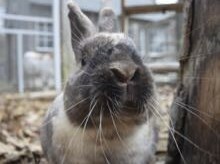 For example, Agnes recovered nicely after her spa treatment for about ten days, but then went back into decline. Her necropsy showed that she died of ovarian cancer. But Buffy, who received the Spa Treatment because she ingested too much vetch, a pasture plant which is toxic in large doses, recovered fully. Another time, Buffy’s comb turned dark and she became listless, again, she recovered fully. The Spa Treatment can’t hurt, and I’ve never known a hen who didn’t enjoy it; it just might save your hen. 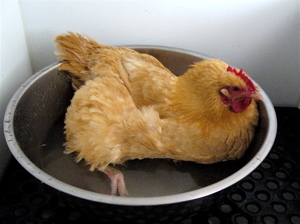 The first step in the Spa Treatment is to give your hen an epsom salt soak. Fill a tub with water that is warm but not too hot, the temperature that you would want to bathe in. Add a cup of epsom salt to the water. Set your hen into the tub. Few hens struggle to get out. Yours should settle right in. You might have to gently encourage her to sit down. The water should come up to her chest, but no higher. Let her soak until the water cools. If she is particularly poopy or dirty, you can use soap and wash her, then refill the tub with water and epsom salts and soak again. (To see how to bathe a hen, watch my YouTube video.) Gently lift her out of the bath and pat dry with a towel, then use a blow dryer on low. The hens like that, too! Next in the Spa Treatment is to dose with olive oil. Enabling a hen to clear out her intestinal tract can often set a hen right.Hopefully, your hen is strong enough to eat. Two teaspoons of olive oil helps to move whatever is in her system along. The easiest way to give this to her is to put it on her favorite treat and let her eat it (try it in cooked oatmeal or pieces of bread.) If your hen is not able to peck at and swallow even her favorite treat, then she is likely too sick for the Spa Treatment to work. Lastly, she needs TLC. If the hen likes being in the quiet safety of a dog crate, away from bullying hens, give her some time on her own. If she prefers to be with the flock, put her back with her friends. Hopefully, all of this care will alleviate the symptoms. If the Spa Treatment is going to help your hen, you’ll know within twenty-four hours. If you see a positive change in your bird, you can give the treatment one more time. However, if there is no change, then whatever she has is more serious that than the Spa Treatment can help. If it doesn’t help, at least it hasn’t hurt, and you’ll have narrowed down what might be causing the symptoms. The Spa Treatment has fixed several of my birds, and helped many others. If you have success with the Spa Treatment, do let me know! The more case histories I hear about, the better advice I can give.